Usually when there’s a story about a guy who is six feet, six inches and 238 pounds, chances are pretty good he’s a basketball or football player, possibly a baseball player. But Jordan Greenway not only doesn’t play any of those sports, he’s something even more rare. He is a Black American hockey player, the very first African American to play on the United States Olympic hockey team. Greenway already made a name for himself in the 2017 World championships. He played for the United States Junior team that ended up winning the gold medal. He finished as the number two scorer on that team. Greenway’s currently playing for the Boston University Terriers, where’s he’s scored 25 points in 28 games. He has the chance to achieve even more history besides being the first Black player on the Olympic team. Greenway could become the first American to play on gold medal winning teams at both the world Juniors and the Olympics. He’s also being hailed as someone who could do wonders for diversity in the NHL. There are now more Blacks in the NHL than at any time in history, though most are like the Predators’ P.K. Subban. They are either Black Canadiens, transplanted Africans, or Blacks who grew up in Europe and picked up the game there, or whose families moved to Canada. But Greenway’s following in the footsteps of such prior African American hockey players as Mike Greer, another BU player and Seth Jones, son of former NBA star Popeye Jones and an All-Star defensemen for the Columbus Blue Jackets, as well as a former Nashville Predator. The Olympics were widely viewed as a distant dream for Greenway until the NHL announced earlier last year they wouldn’t allow their players to compete in the Olympics this time. League management felt it was too much of a burden to shut down their season for two weeks while various players were at the Seoul Olympics. For Greenway, who had an assist during BU’s 3-2, double-overtime win over Harvard in the Beanpot Tournament, it meant one dream was being fulfilled, but he’d have to miss the Beanpot championship. “I never thought it would come this soon, like before I graduate from college,” he said. “But I’m excited it’s happening this year and I’m going to take full advantage of it.” He’s also projected for future NHL stardom. A 2015 second-round draft pick by the Minnesota Wild, he bypassed an early pro career to attend BU. Greenway is a big forward who likes to get in front of the net and “wear a team down.” He cites yet another Black American NHL regular, Wayne Simmonds, who’s played with the LA Kings and Philadelphia Flyers as a role model, as well as the San Jose Sharks’ Joe Thornton. But he got his biggest thrill aside from the Olympic selection last month in Boston, when he got the chance to meet Willie O’Ree, the man who broke the NHL’s color barrier in 1958. 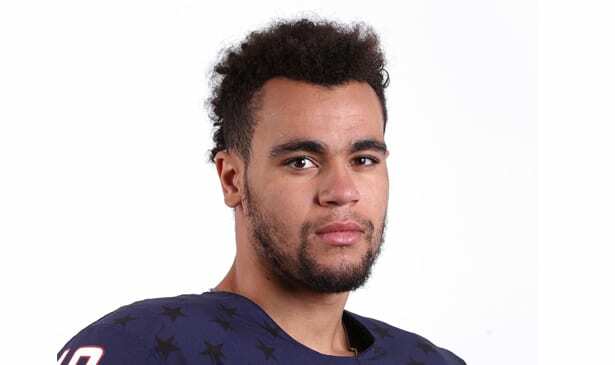 Down the line, perhaps Jordan Greenway will prove an equal inspiration to other aspiring Black kids who want to play hockey, showing them there’s room in every sport for anybody with the skill, determination and desire to reach the top.